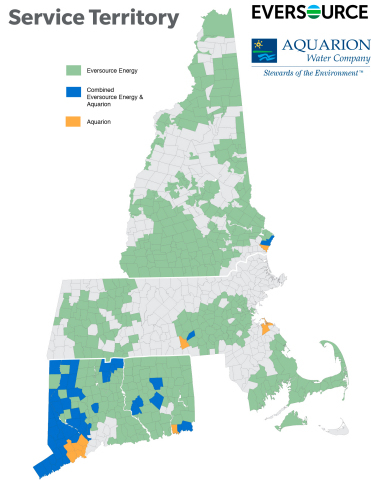 HARTFORD, Conn. & BOSTON--(BUSINESS WIRE)--In an acquisition that will combine New England’s largest energy company with the region’s largest private water company, Eversource Energy (NYSE: ES) today announced that it reached an agreement to acquire Aquarion Water Company for an enterprise value of $1.675 billion, comprised of $880 million in cash and $795 million of assumed Aquarion debt. Aquarion is highly respected in the industry, with top customer favorability ratings and an impressive team of more than 300 employees operating the region’s best water system. Eversource’s committed 8,000 employees work tirelessly every day to provide sustainable energy solutions and power the region’s economy, serving 3.7 million electric and natural gas customers in Connecticut, Massachusetts and New Hampshire. Aquarion serves nearly 230,000 customers in the same states. Since 2007, Aquarion has been owned by a partnership led by Macquarie Infrastructure Partners. Aquarion’s superior operational performance earned the company a number one ranking among Northeast water companies in recent customer satisfaction surveys. Eversource is recognized as the top U.S. utility for its energy efficiency programs, saving its customers nearly $1 billion and resulting in a reduction of carbon dioxide emissions by three-quarters-of-a-million tons annually. The acquisition requires approval from the Connecticut Public Utilities Regulatory Authority, the Massachusetts Department of Public Utilities and the New Hampshire Public Utilities Commission. It also requires U.S. Justice Department review under the Hart-Scott-Rodino Act. The transaction is expected to close by December 31, 2017. Eversource intends to finance the transaction with a combination of cash and a small amount of debt. Evercore is acting as exclusive financial advisor and Ropes & Gray LLP is acting as legal counsel to Eversource. Eversource (NYSE: ES) transmits and delivers electricity and natural gas for approximately 3.7 million electric and natural gas customers in Connecticut, Massachusetts and New Hampshire. Recognized as the top U.S. utility for its energy efficiency programs by the sustainability advocacy organization Ceres, Eversource harnesses the commitment of its approximately 8,000 employees across three states to build a single, united company around the mission of safely delivering reliable energy and superior customer service. For more information, please visit our website (www.eversource.com) and follow us on Twitter (@EversourceCorp) and Facebook (facebook.com/EversourceEnergy). 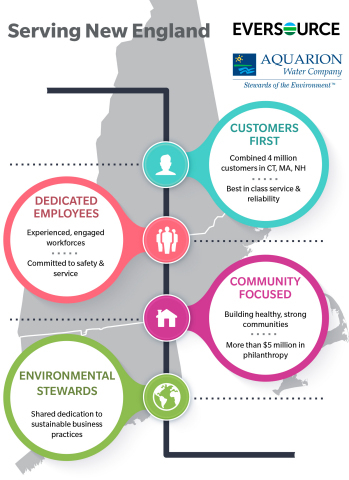 Aquarion Water Company is the public water supply company for more than 625,000 people in 51 cities and towns throughout Connecticut, as well as serving customers in Massachusetts and New Hampshire. It is the largest investor-owned water utility in New England and among the seven largest in the U.S. Based in Bridgeport, Conn. It has been in the public water supply business since 1857. Across its operations, Aquarion strives to act as a responsible steward of the environment and to assist the communities it serves in promoting sustainable practices. For more information on Aquarion Water Company and its subsidiaries, please visit www.aquarionwater.com or www.facebook.com/aquarionwater. Forward Looking Statement: This news release includes statements concerning Eversource Energy’s expectations, beliefs, plans, objectives, goals, strategies, assumptions of future events, future financial performance or growth and other statements that are not historical facts. These statements are “forward-looking statements” within the meaning of the Private Securities Litigation Reform Act of 1995. In some cases, readers can identify these forward-looking statements through the use of words or phrases such as “estimate, “expect,” “anticipate,” “intend,” “plan,” “project,” “believe,” “forecast,” “should,” “could” and other similar expressions. Forward-looking statements involve risks and uncertainties that may cause actual results or outcomes to differ materially from those included in the forward-looking statements. Factors that may cause actual results to differ materially from those included in the forward-looking statements include, but are not limited to, cyber breaches, acts of war or terrorism, or grid disturbances; actions or inaction of local, state and federal regulatory, public policy and taxing bodies; changes in business conditions, which could include disruptive technology related to Eversource’s current or future business model; changes in economic conditions, including impact on interest rates, tax policies, and customer demand and payment ability; fluctuations in weather patterns; changes in laws, regulations or regulatory policy; changes in levels or timing of capital expenditures; disruptions in the capital markets or other events that make Eversource’s access to necessary capital more difficult or costly; developments in legal or public policy doctrines; technological developments; changes in accounting standards and financial reporting regulations; actions of rating agencies; and other presently unknown or unforeseen factors. Other risk factors are detailed in Eversource’s reports filed with the Securities and Exchange Commission (SEC) and updated as necessary, and are available on the SEC’s website at www.sec.gov. All such factors are difficult to predict and contain uncertainties that may materially affect Eversource Energy’s actual results many of which are beyond our control. You should not place undue reliance on the forward-looking statements; each speaks only as of the date on which such statement is made, and, except as required by federal securities laws, Eversource Energy undertakes no obligation to update any forward-looking statement or statements to reflect events or circumstances after the date on which such statement is made or to reflect the occurrence of unanticipated event. Eversource Energy today announced that it reached an agreement to acquire Aquarion Water Company.